Hundreds of Bay Area tech workers walked out Tuesday in protest of President Donald Trump. 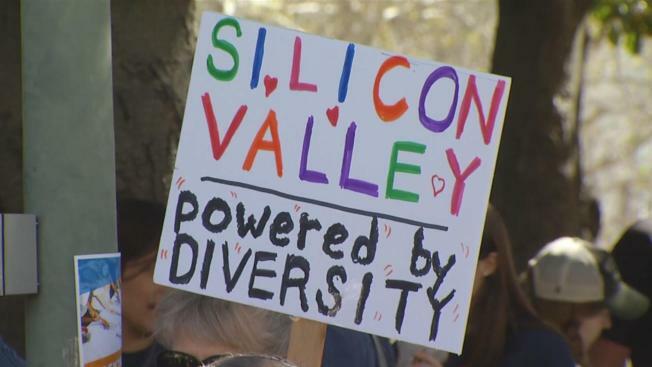 A rally organized by the "Tech Stands Up To Trump" group started at 2 p.m. at King Plaza in Palo Alto. The demonstration focused on immigration, equality, fair wages and after the president announced a revised travel ban targeting predominantly Muslim nations. "The first time we heard about the executive order it felt like America is no longer the same," said Chandana Suggale of Marketo. "The values we attribute to the United States -- they are not good anymore. Business and tech reporter Scott Budman has more in the video report above.